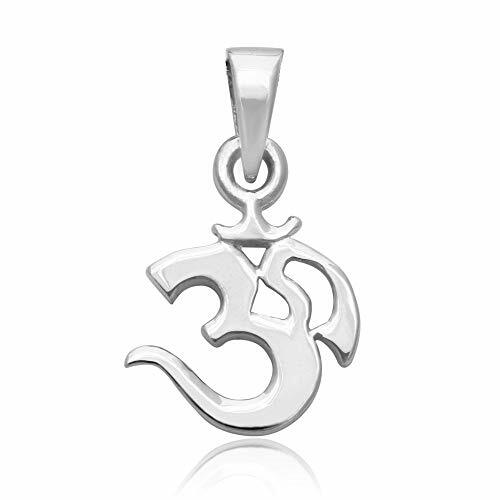 Feel great when this Ohm pendant hangs around your neck. Set in sterling silver. Stamped with the 925 trademark for authenticity. 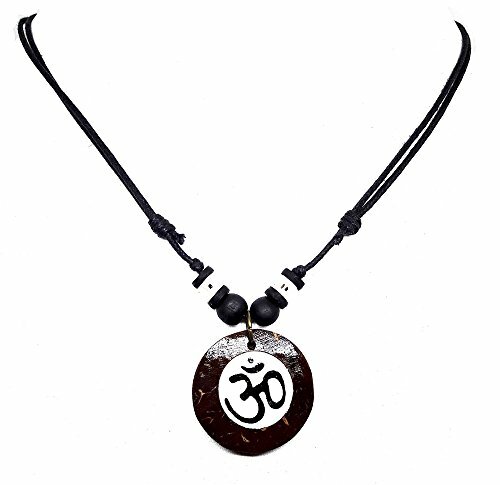 This beautiful mandala Ohm necklace would be a wonderful addition to any wardrobe. The included black velvet pouch also makes it the perfect gift for someone special. Made from high quality 925 sterling silver, stamped 925 Nickel Free. The pendant comes with the sterling silver snake chain 18'', Spring ring clasp About Chuvora JewelryChuvora Jewelry is a Mystic Clothing brand based in Palm Coast, Florida. Despite our rapid growth, we have remained loyal to our original hallmarks: Quality and value, ease of ordering, and integrity. GemstonesWhen present, gemstones may have been treated to enhance properties such as color and durability. See listing details for treatment disclosure information. Jewelry Care While Chuvora products are designed to last, proper care is an important part of keeping your jewelry looking it's best. Be sure not to wear your jewelry while cleaning or working with harsh chemicals, in pools or spas, or while playing sports. Store your jewelry individually to keep them from scratching each other. Store sterling silver jewelry with anti-tarnish strips to keep them looking their best. To clean your jewelry, use a warm, soapy water soak and a soft brush - especially when cleaning jewelry that contains gemstones. This item is one of our designs that 925collections carefully choose for our customers in order to pass our love forward. It's not only made from high quality 925 Sterling Silver but also comes with the protective box to ensure that it will deliver to you and your loved ones safely. Let this item brings the happiness to you and your loved ones.And thank you for choosing 925colletions to be a part of sending the happiness. Jewelry Care Keep your jewelry in a dry airless environment e.g. an airtight plastic bag. It can slow down the chemical process that results in tarnish. Avoid any exposure of your jewelry to household chemicals, perspiration and cosmetics. Clean your jewelry gently by using a jewelry cleaning cloth. Do not use toothpaste to clean silver jewelry that can be easily scratched. Clean your jewelry often in order to prevent the dark tarnish on your silver jewelry. This is the ultimate pendant necklace, complete with style and sportyness. A sterling silver made necklace. 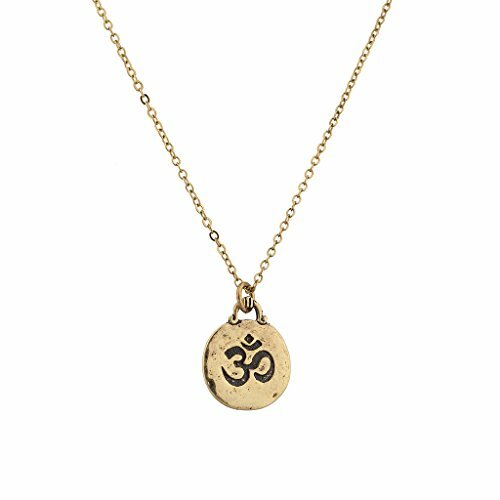 This durable chain carries a Om Aum Ohm charm that makes it pretty and polished for the perfect gift for a yoga-loving friend or loved one. 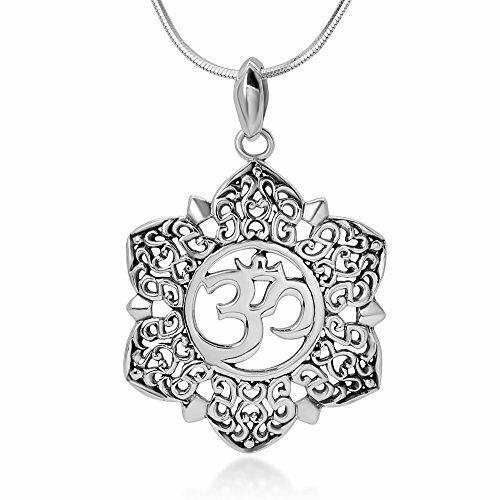 925 Sterling Silver Yoga Om Aum Ohm Symbol and Lotus Flower Pendant Necklace, 18"
The sacred Hindu Syllable, the "ohm" printed on this medallion 10k gold pendant necklace creates an elegant and contemporary style. This jewelry was made by Dawapara Jewelry company - specialized in designing and making the very fashion jewelry to meet customers' taste, the size and the meanings involved are all perfect for women and men. Made of high quality - alloy, eco-friendly made, free of nickle and lead. If you are choosing a present for your family and friends, Dawapara jewelry is a nice choice you will not regret.attached with a nice velvet pouch package, shipped by e-packet with tracking number. 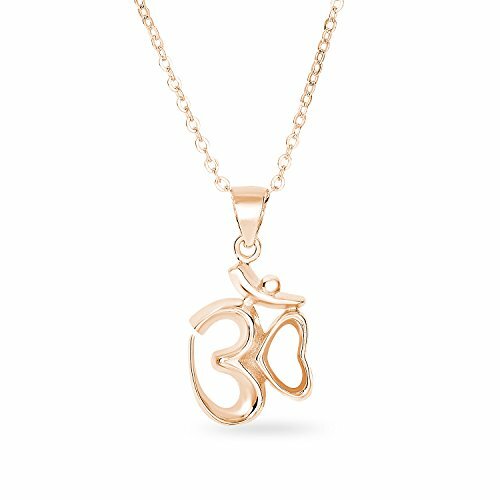 14k Rose Gold Plated 925 Sterling Silver Matte Finish Yoga Aum Om Ohm Sanskrit Yogi Spiritual Harmony Pendant Necklace,18"
The necklace is fully adjustable from 16" to approximately 26". You simply slide the barrel knots to bring the necklace to the length you desire. This gives the wearer several options as to how they want to wear the necklace, as a choker style or let it hang low, it's up to you. 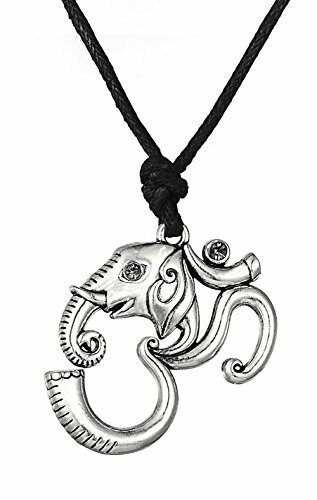 When fully extended the necklace easily slips over the head of an adult. 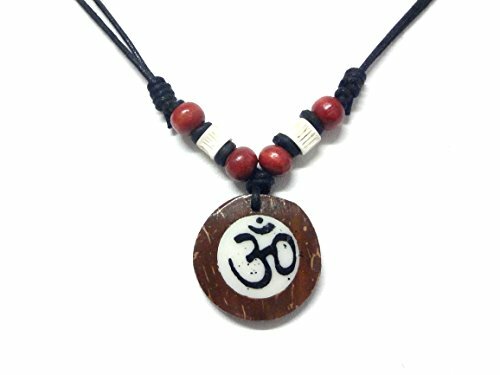 The beads are made from coconut wood. Relax, mediate, and find your center as you resonate the sound of "Om". 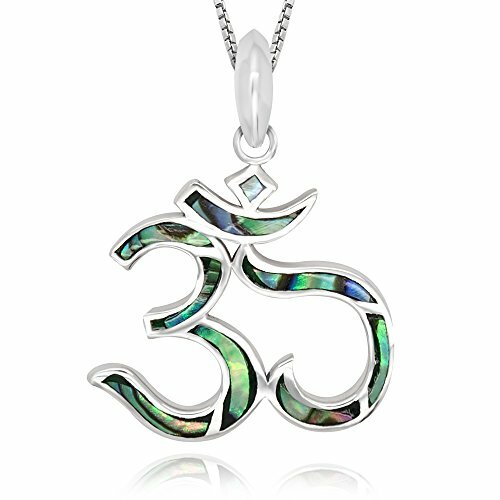 This Sterling Silver Om Necklace Pendant has a smooth high shine polish on both front and back to make a flawless silver necklace pendant for everyday and dressy looks. 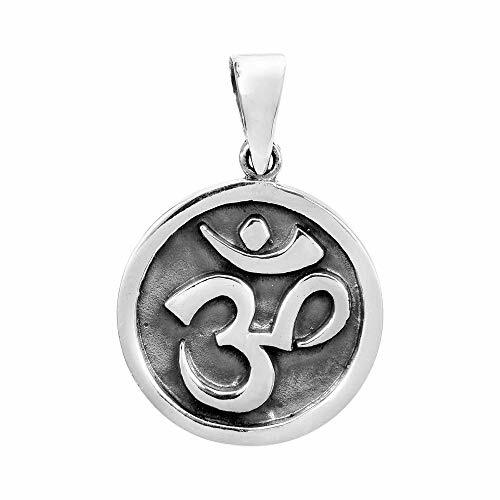 The Aum or Om symbol is safely encased in a round shape pendant. 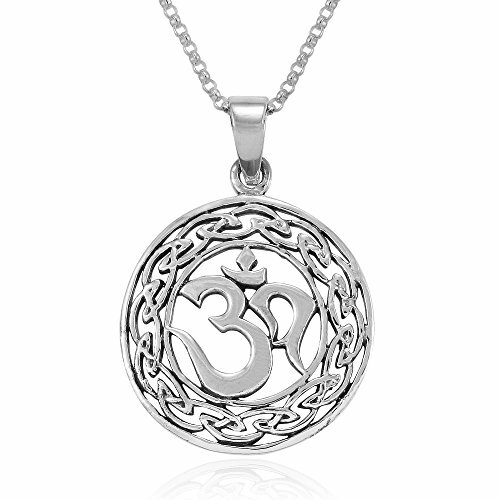 Crafted with .925 sterling silver, this pendant features the Aum or Om symbol that represents the 'Absolute' and source of all existence. PLEASE NOTE: The handcrafted nature of this product will produce minor differences in design, sizing and weight. Variations will occur from piece to piece, measurements may vary slightly. AERAVIDA works directly with gifted and talented Artisans from all over the world. At the core of our philosophy is fair trade and fostering a sustainable future for our Artisans. ARTISAN STORY: Khun O' has a passion for jewelry and has devoted her life to her craft. Khun O' and her husband own and operate a silver factory in Bangkok. Khun O' recruits and trains people from the far provinces to work at her factory. Her kindness and warm personality motivates her team and provides many job opportunities for people from the province. 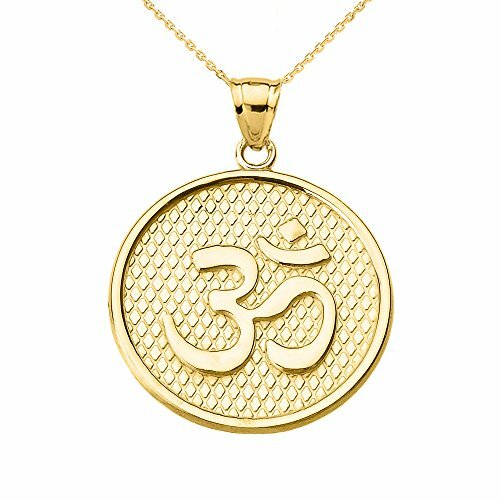 14K Gold Hindu Meditation Charm Yoga Om (Aum) Pendant Necklace, 18"
Relax, meditate, and find your center as you resonate the sound of "Om". 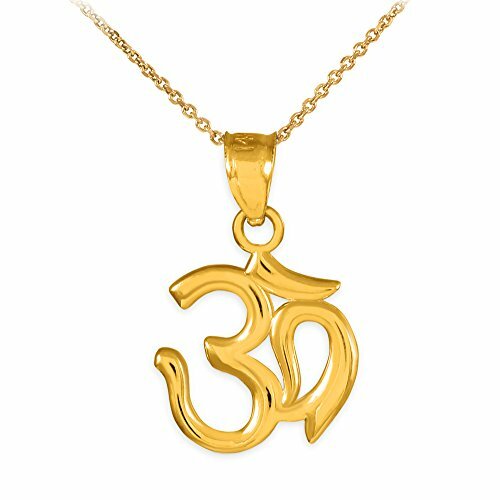 This solid 14 karat yellow gold Om pendant necklace has a smooth high shine polish on both front and back to make a flawless gold necklace for everyday and dressy looks. 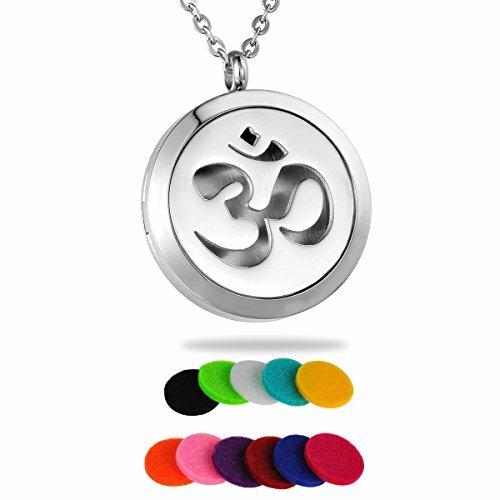 Middle Eastern Jewelry Unique Sterling Silver Stay Calm Om/Ohm Hand Signal Pendant Necklace, 18"
This fine sterling silver pendant necklace features a hand sign, "Stay Calm" with a single syllable word "OM" and it is a common sign for Hinduism. 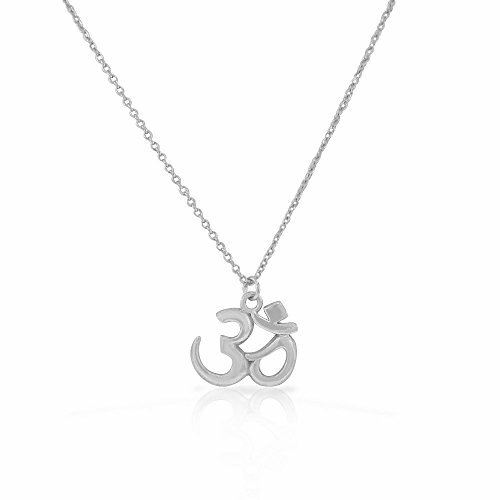 The vibration of "OM" symbolizes the manifestation of God. People use this sign/symbol for meditation and worship. 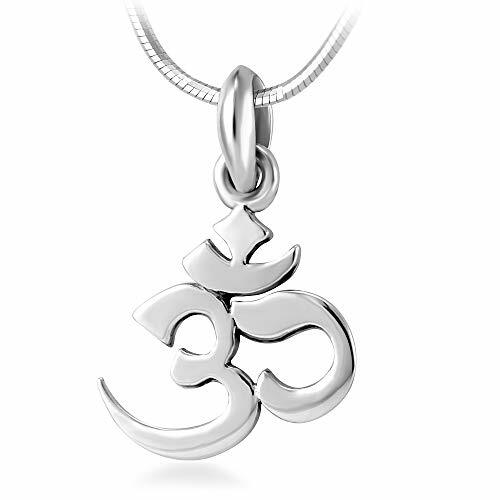 Nowadays "OM" can be seen virtually everywhere.Individually hand polished to a lasting high sheen polish finish. This pendant is both of unsurpassed quality and impressive design. 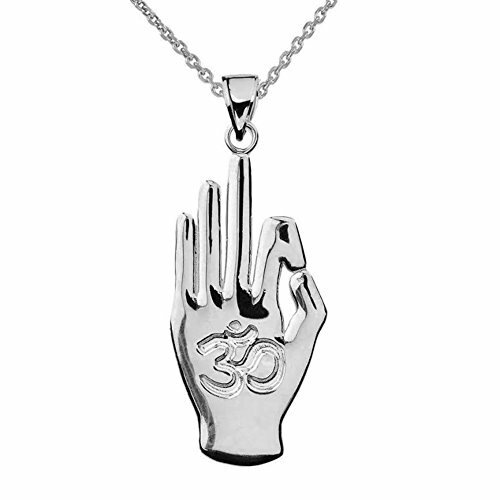 A perfect gift for a loved one, wear this to show one of the most important spiritual symbols. Mimi Silver. 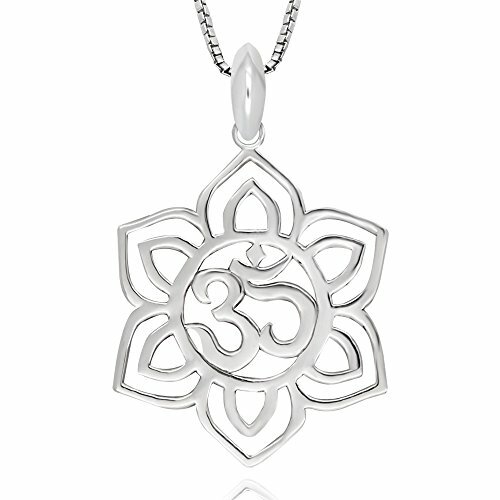 Made of High Quality Sterling Silver with 925 stamped for authenticity. 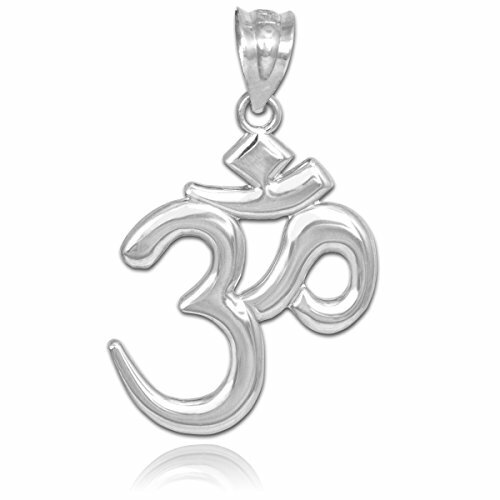 These sterling silver pendant are a must-have for every jewelry collection. Come with sterling silver chain necklace 18" long (0.8 mm thickness). 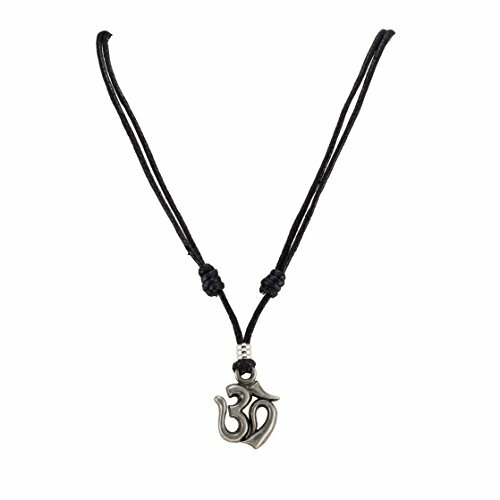 Compare prices on Om Ohm Pendant at Elevelist.com – use promo codes and coupons for best offers and deals. We work hard to get you amazing deals and collect all avail hot offers online and represent it in one place for the customers. Now our visitors can leverage benefits of big brands and heavy discounts available for that day and for famous brands.